IBM® Security zSecure™ Alert for IBM Resource Access Control Facility (RACF®) makes mainframe security event management and auditing more efficient by enabling you to move from point-in-time monitoring to near real-time alerting. It helps ensure security breaches or mistakes are quickly intercepted, maintaining confidentiality, integrity and availability of your systems, applications and data. 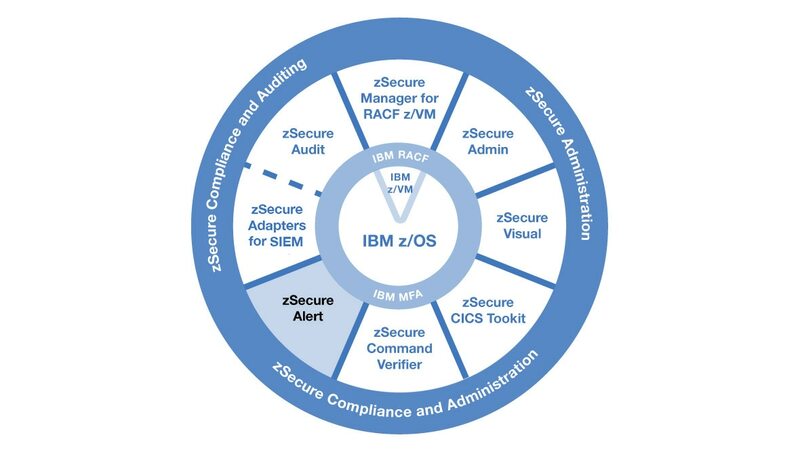 zSecure Alert for RACF monitors and generates alerts for IBM z/OS®, IBM Health Checker, RACF, CA ACF2 and major sub-systems, including IBM Communications Server, UNIX, IBM Tivoli® Workload Scheduler. Supports continuous monitoring of critical system settings and sensitive data to detect changes with no event triggers. Enables you to configure alerts when changes are detected. Sends critical alerts to help you quickly respond to security incidents that could have significant business impact, including mainframe security events in the enterprise-wide monitoring tools. Enables you to create and manage near real-time alert messages to enforce separation of duties between implementers and monitoring functions.